Data management and storage is a problem for organizations large and small. In this post I’m going to lay out how I approach helping these groups come up with a comprehensive strategy that meets their needs. how do I make it easy to add, find, and use data? what processes will help us organizing and manage our data? what tools can we use to support managing our data? what is the appropriate level for my organization? These focus as much on technological solutions as social processes. You need to understand what does and doesn’t work already within your community before making a plan to move forward. This map can be helpful to help figure out where you are, and where you want to be. It isn’t necessarily the case that you need to be in the top right of this chart (ie. 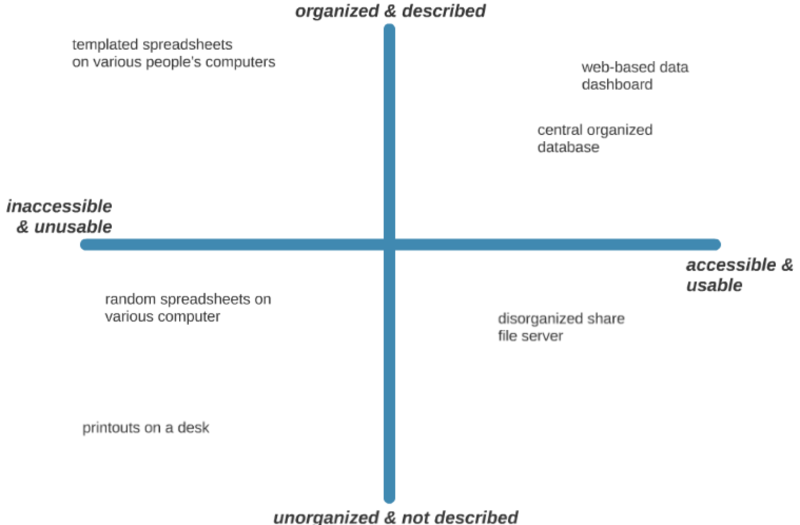 very organized and very accessible)… you need to figure out what is right for your organization. A shared internal file server (sharepoint) or external sharing service (dropbox) can be helpful to get all your data in one place and expose it to everyone. An online data portal can help you collect, organize, and share your data internally and externally. Lots of cities around where I live use Socrata. Many of the mid-sized organizations I have worked with use the open source ckan project. If you are focused on helping people access your data with software APIs and/or code, or need strong support for versioning your data, look for online platforms like GitHub. Obviously the solutions that are right for you need to fit your data and topic – if you work on sensitive issues of personal data, you need to be especially sensitive to understanding where these online platforms store your data and how they might back it up. 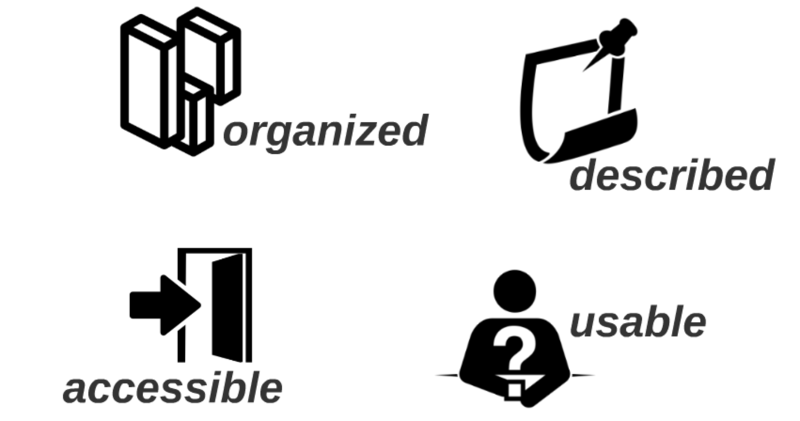 what data language does our organization speak already? how is our data organized right now? what needs must any solution we use meet?